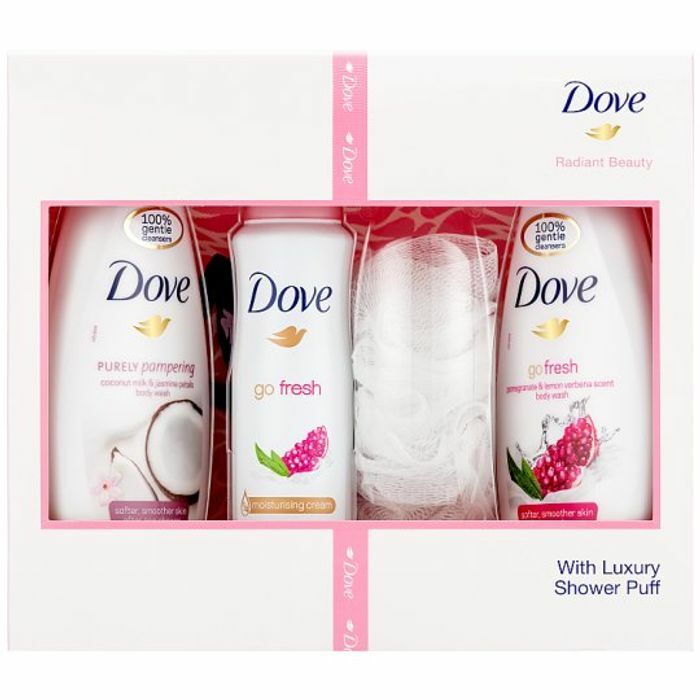 A perfect gift set for her this Christmas - the Dove Radiant Beauty Trio Gift Set with Luxury Shower Puff. Enjoy the radiant beauty collection from Dove, designed to uplift your senses and leave you with the feeling of radiantly soft skin. It's a must have Womens toiletries gift set this Christmas. This delightful gift set contains three full sized products: Go Fresh Pomegranate and Lemon Verbena Scent Body Wash 250ml (x2) & Purely Pampering Coconut Milk & Jasmine Petals Body Wash 250ml and a Dove Luxury Shower Puff. Showers are the most refreshing part of our day. To make them even more refreshing, why not add a dash of pomegranate and lemon verbena fragrance to your body wash? That’s where this Dove Body Wash comes in. It’s enlivened with an invigorating pomegranate and lemon verbena scent to awaken and refresh your senses. As well as giving a revitalising boost to your morning, Dove Go Fresh Revive Body Wash uses gentle cleansers to maintain your skin’s natural moisture and NutriumMoisture technology to deposit skin natural nutrients. So, if you’re wondering how to get smooth skin – with our Dove bodywash you can get softer, smoother skin after just one shower. Their revitalising fragrance and nourishing ingredients will boost your mornings with an extra energy punch. It’s like starting your day with a power smoothie – except in the shower. The perfect gift set for women this Christmas. What a great gift at a great price! Definitely grabbing one of these for my mum!